And Then They Came for Me: Remembering the World of Anne Frank shares the stories of Holocaust survivors Helmuth Silberberg and Eva Geiringer through a compelling multimedia production that combines video interviews with live performance. We hope their stories will act as a catalyst for challenging conversations necessary to cultivate compassion and ignite empathy in everyday life – because sharing those stories is a vital part of what makes us human. “These stories need to be told, questions need to be asked, and these people can’t be forgotten,” says Associate Artist Mark Tucker, referring to very real accounts of Holocaust survivors portrayed in LCT’s upcoming production of And Then They Came for Me: Remembering the World of Anne Frank. And Then They Can for Me follows Ed Silberberg and Eva Geiringer Schloss’ journeys of loss, persecution, and resilience. Like Anne Frank, the famous young girl whose diary was published detailing her experiences during the Holocaust, they also wrote down their stories and have been quite vocal about the events of their lifetime through not only writing, but interviews and documentaries. “We’ve all heard the phrase history repeats itself and it’s interesting because the further removed that we get from the Holocaust and that time, more people tend to forget, and you see elements of oppression cycle again.” says Associate Artist Emily Asbury. “Right now, people are so afraid of the other and afraid of people different than themselves and it’s an excellent reminder of what path we don’t want history to take,” says Asbury. And Then They Came for Me uses reels of interviews and picture projections of the Holocaust and the survivors. “There were parts of WWII and the atrocities that were filmed and that’s a really powerful thing. There is such a difference between reading about stuff from a newspaper and actually being able to see videos and photos of these unthinkable situations,” says Tucker. Asbury also adds that having people reenact true events, along with other forms of media, creates a better picture of the human experience. “When I have played historical characters, for some young audience members, they suddenly understand the severity of the circumstances. Students will come up to me after shows sometimes, with urgency, and ask, ‘Did that really happen? Is that a real person?’” says Asbury. “As an artist in a production like this we are a living memorial for these real people who came before us. In a way it feels like the best way to memorialize them.” says Asbury. 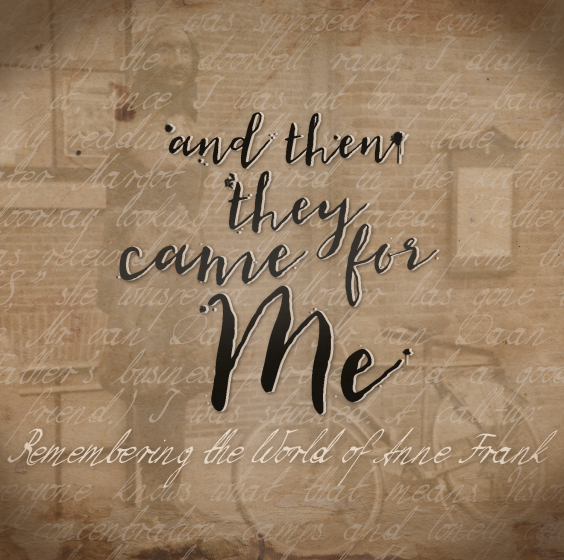 Experience the brave and inspirational true stories in And Then They Came for Me: Remembering the World of Anne Frank, Saturday February 16th at 7:00pm and Sunday February 17th at 2:00pm on the LCT Main Stage.